In mixing bowl, mix the flour and salt until well blended and smooth. Add 1/2 cup of water and continue to mix. Slowly add the remaining water, turning the dough in the bowl. Push the dough into a ball, working in any dry flour and salt at the bottom of the bowl. Knead on a floured surface for at least 10 minutes. Wrap the dough tightly in plastic or Ziplock baggie until ready to use. Preheat oven to about 250°-300°. Place cut out dough on a flour dusted heavy-duty cookie sheet. Remove from oven with potholders and let the pieces cool completely on the wire rack. The amount of time needed for baking is from a half hour to several hours, varying from oven to oven and project to project. You must judge when the item is completely baked so start by baking the pieces for about 20 minutes and then examine it. Small items may indeed be baked in that short of time while larger pieces will need more time in the oven. Check the dough every 10 minutes. The only sure way to judge hardness is to let the item cool slightly and then press it gently as you would a cake. If it gives, it's not cooked enough. If it doesn't yield to pressure, it is probably completely baked, but you must turn it over carefully and check the underside as well. If it is not firm, return the piece back to the oven, underside up and let it bake some more. Mix a batch of the flour/salt dough. Roll out to 1/2" thickness and cut with heart shaped cookie cutter and make a hole in the top of each heart, for the ribbon or hanger, with the end of the straw. Bake in oven until hard following the instructions above. Let cool completely. Base coat each heart with desired color using acrylic paint (paint both back and front). Paint two coats and let dry completely between each coat. 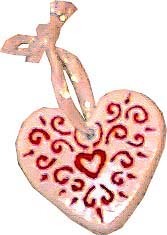 Using the dimensional paint, draw a design on the heart. Immediately sprinkle the Beedz onto the paint so that they will stick to the paint. Pour off any excess Beedz. Let the paint dry completely. Repeat step 5 and 6 for the backside of the heart. Cut a 10" length of ribbon or cord for the hanger and thread through the hole in the heart. Tie a double knot and a bow. This finishes your Valentine Heart!